Why Tiger Woods, of course. New golf course rankings, too. Top 100 lists always get a certain segment of the golf world talking – we’re looking at you, architecture snobs – and GOLF Magazine contributed a conversation piece with its 2011 list of the best in the U.S. and the world. Plus, Golf Digest revealed a surprise winner in its Fans’ Choice tourney to determine America’s favorite public track. Couples wants Woods on his team. He needs Woods on his team. (Actually, that part’s debatable.) And Freddie has the last word on whether Woods will, indeed, be a member of America’s Presidents Cup squad taking on the Internationals at Australia’s Royal Melbourne, Nov. 14-20. On Sept. 26 Couples will add two captain’s picks to the 10 automatic qualifiers. Woods is currently 28th in the standings and has just one event, the Australian Open, scheduled between now and the Cup. While Woods was an obvious captain’s pick for last year’s Ryder Cup team – he was still ranked No. 1 in the world, after all – he’s certainly not a no-brainer this time around. Then again, neither is anyone in spots 11-27, including Rickie Fowler, Zach Johnson and Keegan Bradley. At this point, Bradley looks like a better choice than Woods. When it comes to the topsy-turvy state of golf, that pretty much says it all. American golfers may have lost their place atop the world standings, but the country’s courses still reign supreme. At least, according to GOLF Magazine. GOLF recently rolled out its rankings of the top 100 courses in the U.S. and worldwide, with Pine Valley GC in New Jersey leading both lists. No surprise there, since Pine Valley – a mind-blowing combo of penal and strategic design – almost always comes out No. 1. The magazine’s world rankings leave it open to cries of provincialism, though. GOLF ranked eight American courses among the world’s top 10 and 20 in the top 30. All told, the top 100 features 51 tracks on American soil. And how many of the U.S. top 100 can you, John Q. Public Golfer, play without a membership or invite? Sadly, only about 20. The public ranks are boosted mightily by Oregon’s Bandon Dunes Resort, with all four of its courses among the nation’s 100 finest. 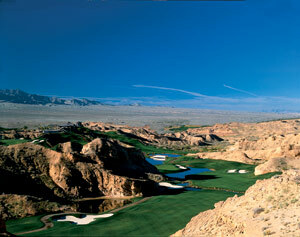 Wolf Creek Golf Club in Mesquite, Nevada (pictured right). What, you were expecting Pebble Beach? Actually, Pebble entered as a No. 1 seed in the 64-course tournament, but was upset in round two by True North GC in Michigan. Joining Wolf Creek in the final four were 2015 U.S. Open host Chambers Bay (Washington state), Bulle Rock GC (Maryland) and Oregon’s Pacific Dunes. What put Wolf Creek over the top? It’s over-the-top setting and design, most likely. Equal parts golf course and amusement park, Wolf Creek roller-coasters over massive cliffs into canyon floors – it’s nothing if not memorable.